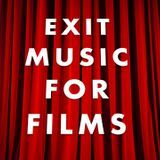 Exit Music for Films is a music radio show which tries to showcase a variety of eclectic music either originally composed for or majorly inspired by films. Each weekly show would feature film-oriented music in a variety of formats, including original film scores, selections from motion picture soundtracks, prominent individual songs in key film scenes, or even interpretations (i.e. “covers”) of the aforementioned music. Monday nights at 11pm MST live on CJSR (88.5 FM in Edmonton, Alberta, Canada or online at cjsr.com), with your host, SolarPriest.